Landed my first M car this week. After making some track events in my C63 507 ed.... and my old C5 Z06..... 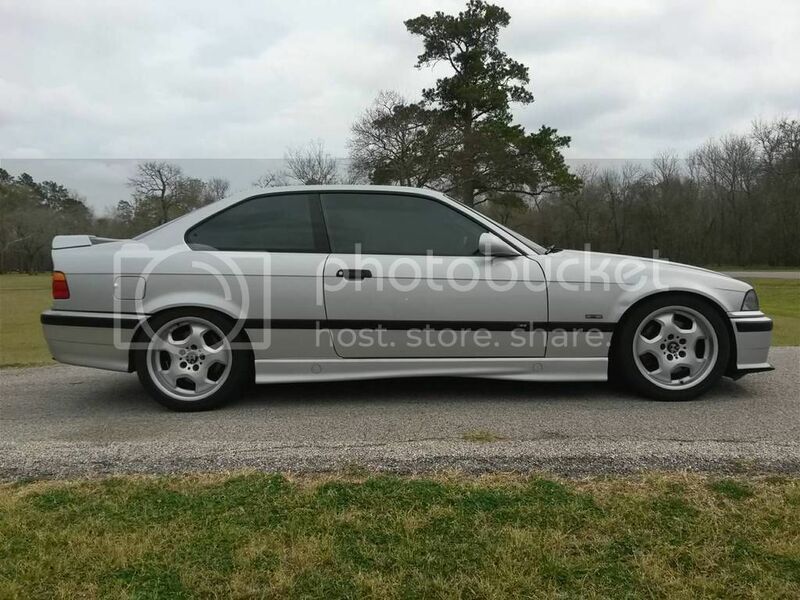 I really wanted to build up an E36 M3. The good price point, the potential for a future LS swap (vorshlag)..... got me motivated. I'm keeping the C63 for weekend..... but depending on how this build turns out... I just might off the merc. (more to come). Last Tues - picked up the craiglist 176K mile 1999 M3 for $8.8K USD. WAs local sellers dd for 7 yrs.... so not from a flipper. Always a Tx car. No wrecks etc..
Comes with mods: Dinan Ported TB, CAI, Tune, and LT Header, Dinan Catback. Lowered on HR sports, and Bilsteins. Known Issues: random brake light circuit warning (but brake lights work), air bag light (plan to remove anyway, perhaps install res across circuit), seats pretty worn (recover, or race seats TBD), needs brake job, rear shocks blown... TLC. 1. sounded like the rear subframe was falling off over bumps.... literally on teh drive home and not before... I thought OH Hellllllll I got shafted..... it was just the rear shock mounts on top disintegrated..... so the shocked were dancing in the perches..... what a racket. (no flames.... just installed a couple old 5.0 mustang bushings.... until my new bilsteins arrived)>>>>> works like a charm. 3. Totally degreased engine bay..... steering rack was covered in 170k mile of crud..... top end of engine was clean.... perhaps a valve cover service? No record of vanos svc... but pulls good up top. 4. Removed 10 yrs old tints.... what a pain.... remove outer skin... then razor blade glue 1 hr /window! 5. cleaned inspected each wheels well, brakes, rotors, wheels, tires, brake lines.... cont arms, etc.... nothing loose by hand... wheel bearings.. no play..... just front rotors/pads shot. ... just ordered cheapo stock rotors for now. I'll probably daily drive for a month of so.... work the bugs out.... then hit an autocross.... then a track day..... and go from there. Glad I found this place. Cool. Keep the updates coming. Nice pick up, you'll enjoy the car on track. Your C63 is markedly faster, on the streets and circuit alike, however you'll quite possible find the E36 to be more fulfilling to drive. These cars are a ton of fun and everything you said about the handling is dead on. Mine is very track oriented, but I still love just jumping in for errands...never fails to put a smile on my face! But on the track is where it really makes yah hoot, amazing car on the track. Looks like a great candidate for $10k worth of LSx swap. Congrats! I was looking at that car, too, but decided against it. I guess I'll see you at the track. Vers---- the merc has been sitting in the gar since I brought this tired //M home..
Pb-- that is my big next fork in the build road------ Freshen up this old 6... I'm sure it could use rings bearings, Or sell it and just get a fresh ls-x. I'm so excited to have my toy so I take my wife to dinner in it the night i drive it home.... She's already skeptical when I chirp the alpine alarm and set off the alarm leaving the house... We roll to dinner w the rear shocks missing the top bushings and she suggest my toy is unsafe.... So we arrive at trendy bar rest and I valet:::::: pull up, get out then alarm goes off and valet guy can't get it started.... Wife unhappy w my track project .... To put the final cherry on top--- I pop the pioneer faceplate off and ask my wife to carry it in her purse. Classic 90's flashback. She says no more dates in that car! Funny how much things change on cars in 18 yrs. Alarm going in the trashbin... stereo getting upgraded soon. Looks like a great project car. Enjoy! All times are GMT. The time now is 12:04:20 AM.